ISLAMABAD, Pakistan-- In an early sign of instability in the new government in Pakistan, the junior partner in the coalition said Monday that it was withdrawing from the cabinet over the failure to reinstate the Supreme Court judges dismissed by President Pervez Musharraf. 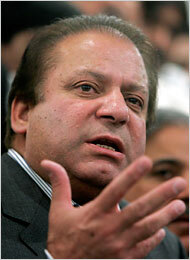 Nawaz Sharif during a press conference in Islamabad on Monday. The move by the Pakistan Muslim League-N to vacate its nine posts in the 24-member cabinet, including the all important finance ministry, was a step short of leaving the coalition and the collapse of the government altogether. But it was a clear indication of just how fragile the coalition remained. The leader of the party, Nawaz Sharif, said he was standing firm on a pledge made by the coalition in March to bring back 57 judges, including the Chief Justice, Iftikhar Mohamed Chaudhry, after their dismissal under emergency rule last November. This is the move that will eventually get Musharraf back into power in Pakistan. When Sharif and his party finally remove themselves from the coalition, the ruling party will need allies and into that breach will step Musharraf. Would be interested in your thoughts on my Paul/McCain post too. Ha ha.